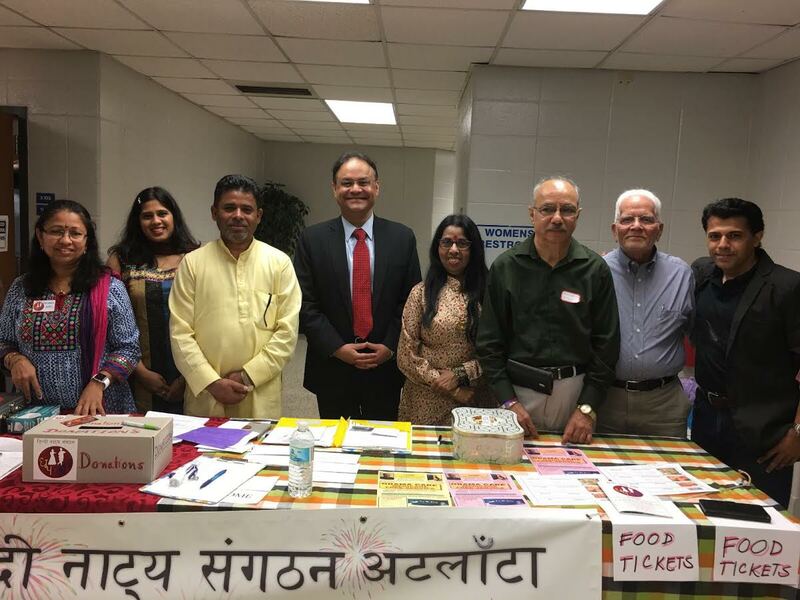 Atlanta, GA: The city once again brimmed with joy when Dhoop Chaoon, an Atlanta-based Hindi theater group, came up with their marvelous 10th anniversary show on 20th May. Dhoop Chaoon, successfully reached to its 10th year holding the hands of Sandhya Bhagat and Anil Bhagat. The opulence in this group doesn’t come with money, but by the hearty participation of its members. From every edge of the world people are welcomed and all the members share a substantial bond of kinship. 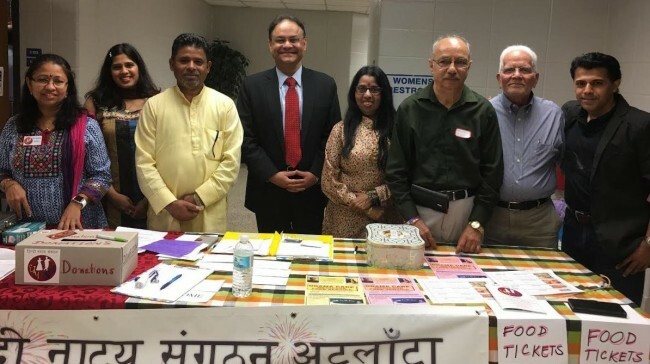 Over 350 people attended the anniversary celebration where the fusion of convention and modernism delivered the messages of love, unity and fraternity prevalent in Indian culture. Aslam Parvez, the emcee, uplifted the show by reiterating its past attainments and glory with his elegant and soliciting voice. Later, when Renu Thapliyal, his co-anchor joined him on stage, it was indeed a visual delight to the audience. The chief guest Consul General Nagesh Singh with Consul D. V. Singh and other dignitaries were felicitated and once they spread their best wishes towards the group the performances took place one by one. The event ushered its first performance through Dastangoi: Sharandata, an act presented through the story-telling method which is almost archaic in today’s world. The story writer Sachidanand Vatsyan Agey and the participants Sachin Bapat, Abhinav, Darshana, Anubhuti, Akanksha Rajpal, Satish Dharamarajan along with the director Sandhya Bhagat were fantastic. Set in the backdrop of India-Pakistan partition, this play invokes the turbulence of the period and the emotional topsy-turvy experienced by both Hindus and Muslims. The terrors of partition is exposed through two friends- one Hindu and another Muslim. Devinder Lal seeks refuge in his Muslim friend Rafeequddin’s house. His anxiety and agitation, helplessness and confusion, friendship and betrayal are depicted fruitfully by the actors. The second performance, a dazzling one, was a tribute to the living legend of Bollywood Madhuri Dixit. Just after the serious play based on partition this dance by Renu Thapliyal was a catharsis to the audience by releasing the tragic tension. She illustrated many of the legend’s songs through her lively and enthralling gestures on stage. To keep up the spirit of diversity a parody is presented next. Gadbad Ghotala (A Scandal of Confusions), a light hearted but thoughtful presentation snatched the audience’s attention bringing up the significance of different languages spoken in India and the importance of learning the national language Hindi. The play held the unique quality of India- ‘unity in diversity’. The actors were Arpana Purani, Veena Katdare, Paresh Jain, Madhav Katdare, Aakanksha Patangay, Anjali Chabria, Vicky Adhikari, Aruna Vinod, Meenakshi Mehta, Renu Kumar and Suparna Pathak. In the whole event even the break got much importance not only because it served some luscious dishes but because the break itself launched the ground for the next performance- Namoozi Kharboozi aur Tota (The Knickknacks and the Parrot), a comic play, originally written by K. P. Saxena. All the actors e.g. Nida Pawar Shariff, Nomana khan, Nidhi Mishra, Rozina Gilani, Nidhi Pipal, Navin Gurnaney, Jayesh Jhurani, Aloke Sharma and Sarfraz Khan with their gorgeous costumes presented the first scene in the cafeteria and the rest of the play was performed in the auditorium stage. This was a new yet enchanting approach prescribed by the director Sandhya Bhagat and needless to say, enjoyed by all. Soon after, Dhoop Chaoon Ka Mukabla (Dhoop Chaoon’s Competition) was conducted in which some talented actors participated. They were: Jayesh Jhurani, Shree Vora, Sachin Bapat, Kamlesh Chugh, Nidhi Mishra, Aloke Sharma, Aakanksha Patangay, Satish Dharamrajan and Darshana Kaur. All rendered their acting talents uttering monologues written by themselves. This section was a great opportunity for the candidates to showcase their inherent capacities and bring them into light. The program went to its final steps with a Bollywood dance. A group of thirteen people (Vikas Jain, Neetu Sharma, Renu kumar, Aarti Lunawat, Shabana Sayeed, Shree Vora, Vyoma Gupta, Aruna Vinod, Tarana Vij, Nidhi Pipal, Moiez Hussian, Manjari Hegde and Varsha Gupta) portraying the traditional Indian sensibility through Garba was a matter of enthrallment. While the actual Garba, originated in Gujarat, India, depicts spiritualism and reciprocity to the divine, this dance on the stage of Atlanta delineated a beautiful fusion of the ancient and the modern. The song in the Bollywood movie Ramleela plays an important role illustrating the moment of excited whirling on part of a woman for her lover to arrive and in a juncture of crisis they are blended into one. This spectacular Garba seasoned with Dhoop Chhaon’s Bollywood touch was indeed an amusing treat to the eyes. The event reached to an end with the program director Sandhya Bhagat’s concluding speeches. Also, the winning candidates of the competition were complimented. Recognition came for the people who had helped in the whole program to make it a hit by their precious presence, continuous support and hard work. Moiez, Aloke, Vicky, Hafeez and VijayTandon helped in the stage setting. Ekta Narula Sethi, Madhav katdare, Bimal Pathak, Nitu Chauhan, Navin Tyagi, Shankar Mahadevan were for other backstage help. Anil Bhagat & Gandharv Bhagat were the key persons for the brochure and Front Desk was managed by Meenakshi Iyer, Rachita Iyer, Shiwali Dariyaporkar, Vinita Goyal and Raj Vora. Food volunteers were Sanjeev Aggarwal and Pawandeep singh. Stalls were handled by Kartikay Bhagat. The beautiful music slide show was performed by Jayesh Jurani, Abhinav Deharia. While Ravi Gupta took care of the lights, Talat and AlviShresha Punugu did the make ups beautifully for each participant. The whole program was captured in camera by Puneet Bhatnagar T. Rahim Hussian (Guru) was the choreographer for the dance and last but not the least Jayshree Baveja & Giri Kanati played all the promo voices. Sandhya Bhagat addressed and thanked all and called them on stage. A gracefully organized show with all its participants, back stage volunteers, camera persons and the amazing audience once again gifted Atlanta a culturally rich landscape. Undoubtedly, the show was an embodiment of hard work and commitment.